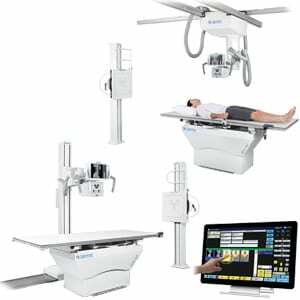 Quantum’s Q-Rad-DIGITAL DRX-Series systems feature Carestream DRX Technology, along with Smart-System innovations such as TechVision™, an Operator Touch-Control Center and the flexibility of Wireless or Wired DR solutions are available in either Ceiling or Floor mounted configurations. All systems provide advanced operational and ergonomic features, with virtually unlimited positioning capabilities. The newest generation of Quantum’s integrated DR Systems with wireless detector technology available in all Quantum Ceiling Mounted System configurations . The “DRX Series” incorporates advanced operational and ergonomic features, with virtually unlimited positioning capabilities. 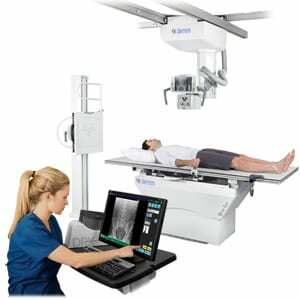 Q-Rad-Digital DRX-Series Floor Mounted Systems: are the ideal choice for the busy imaging centers,orthopedic facilities or hospitals. 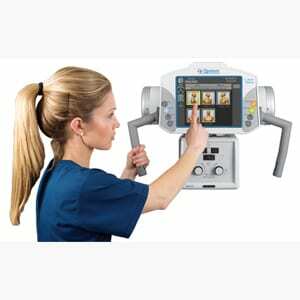 The advanced features and unique design aspects of the system allow the technologist to fully concentrate onthe patient during the exam. Quantum’s TechVision™ is truly an innovation for the Technologist. Technologists can use the color touch display to easily view and set up all technique parameters, as well as access set-up functions right at tube-side. TechVision™ eliminates going back-and-forth from the generator’s Operator Control Panel to the patient, in order to prepare for patient exams. The operator has complete control to adjust exposure parameters right at the tube-side, just as if they were at the generator’s Operator Control Panel. 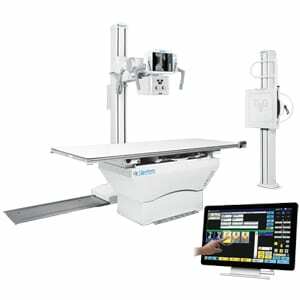 This synchronized generator solution greatly streamlines the imaging process and decreases overall examination time, while allowing the technologist to remain close to the patient, for increased patient care. TechVision™ with Q-Rad-DRX Systems also provide an Preview image display in <3 seconds, Consistent grey scale presentation, Local QC and administrative functions; zoom, window/level, Gamma, edge enhancement, cropping, digital markers, and annotation.